It’s going to be interesting to see what transpires when Batman finds out the identity of this particular teen vigilante. This unauthorized Robin will be lucky if getting fired is the only thing that happens to him. Ever since it launched last summer, DC Comics’ We Are Robin series has been concerned with picking up fractured legacies. Written by Lee Bermejo and drawn by a rotating cast of artists, the book revolves around a crew of teenage newbie crimefighters who started trying to protect Gotham when Bruce Wayne was unable to. Since then, the new Robins tangled with their predecessors in the Robin War crossover, which illustrated the differences between the partners officially trained and sanctioned by the Dark Knight and the youth movement that followed them. The new kids haven’t had real mentorship, and they scramble together resources at the last minute and have to figure out the best ways to mete out justice without crossing the line. This week’s We Are Robin #11 continues the storyline that pits the street Robins against a gang of Jokers led by a kid who’s the same age as them. Johnny Bender’s army of clown-faced criminals has seized Middletown High School and are threatening to kill folks. Robin crew members Duke Thomas and Riko Sheridan are at the school and send text messages asking for help from their partners. One of them is the mohawked mechanic with the first name of Dax. His last name is where things get interesting. 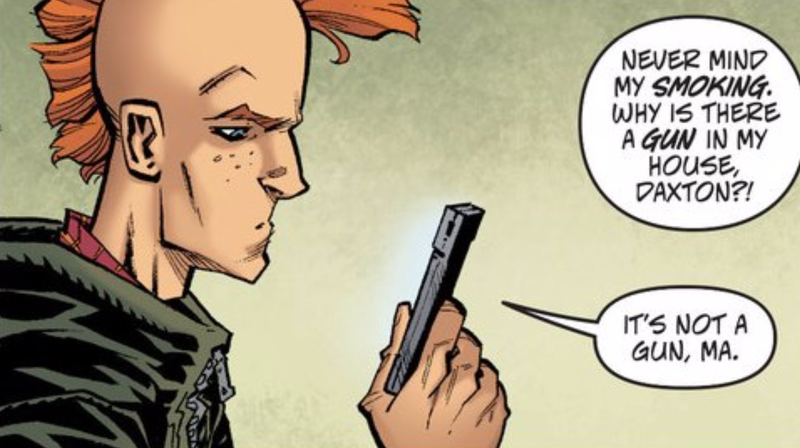 Issue #11 opens up with Dax talking to his mom, who comes upon some crimefighting gear he’s been building. Sadly, this reveal got screwed up a few months ago. When We Are Robin #4 came out last year, the team bios showed Dax’s last name. Sure, he could’ve been just some random kid with a last name weighed down with bad juju in Batman’s hometown. But the redaction of his parents’ names was clearly meant to hide his connection to Bruce Wayne. Then his surname was redacted in the just-released collected edition of the series’ first issues, as it likely was intended to be in the first place. Screw-up aside, this is the kind of plot contrivance that happens in superhero comics all the time, where sudden revelations make the backstories of major players dramatically entangled. In fact, in the Batman: Full Circle story of previous continuity, Chill was shown to have a son who blamed Batman for his father’s death and tried to get revenge against The Dark Knight. Usually, some kind of reckoning happens that pits the characters against each other and some mild change to the status quo happens. But that might not come to pass here. We Are Robin will be ending soon to clear the way for DC Comics’ Rebirth initiative, and it’s not clear where the core group of Robins will be winding up. Dax’s parentage could just be a dangling plot thread that gets ignored as new creative teams come onto the Bat-books and tell all-new stories. It’d be a shame if that happened, though. Dax’s teammate Duke Thomas figured out Batman and Bruce Wayne are the same person and it’s not hard to imagine that information landing in Dax’s lap. I’d like to see what Bermejo or some other writer does with a “whoa, my dad murdered Batman’s parents” plot beat. Given that Dax is trying to help the city where his dad killed people, it’d likely be something more interesting than a turn to the dark side for the teenager. But the state of the DC Universe is in flux, and the fumbled reveal in a second-tier book might just be an unanswered footnote stomped on by the march of yet another editorial reset.